Jackie Joyner-Kersee ranked among the all-time greatest athletes in the women’s heptathlon as well as in the women’s long jump. She won three gold, one silver, and two bronze Olympic medals, in those two events at four different Olympic Games. Sports Illustrated for Women magazine voted Joyner-Kersee the Greatest Female Athlete of the 20th century. “We are excited, nervous, happy … you name it,” said Karen Sprague, treasurer and administrative assistant for the event. “We are very humbled to have someone of her caliber coming to Gallia County to attend and serve as our keynote speaker,” Sprague said. 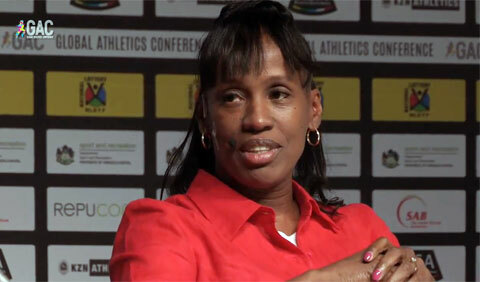 Watch the following video where Jackie Joyner-Kersee is speaking with Ato Boldon about her athletic career in January 2015 at the Global Athletics Conference. Playing Field Promotions is a booking agent for motivational sports speakers and celebrities. If you would like to book Olympic Gold medalists or athletes like Jackie Joyner-Kersee for a speaking engagement, personal appearance or special event, you can request Jackie Joyner-Kersee agent and speaker fee info from PFP Sports & celebrity Talent or call 800.966.1380.